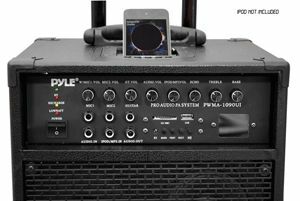 PORTABLE / POWERFUL: This Portable PA Speaker System and Mic set by Pyle Pro is equipped with powerful 800 Watt 10 inch Subwoofer, Mid Range, Tweeter for Full Range Stereo Sound Reproduction and its handle and caster wheels make transportation easy. 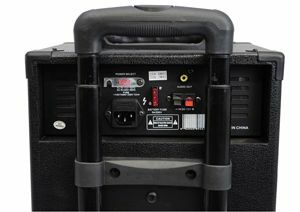 MULTIPLE CONNECTIVITY: The PA Amplifier Speaker features a docking station for iPods. You can also connect other digital music player with the 3.5mm cable, listen to radio, listen to music from SD card or USB stick. 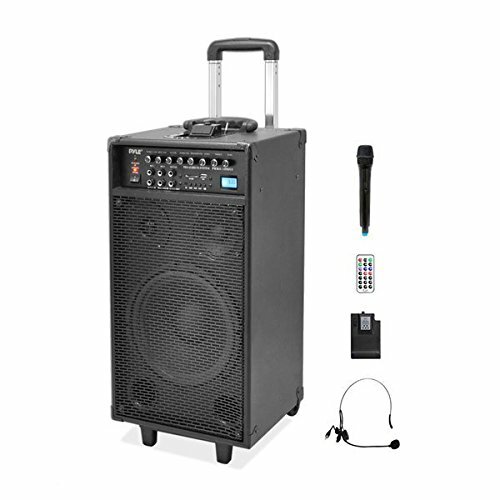 Package includes Beltpack, Wireless Handheld, and Lavalier Mic for karaoke fun. POWER BANK CHARGE DOCK: The integrated docking station for iPods also acts as a charger and charges your iPod or iPhone while playing your favorite music. 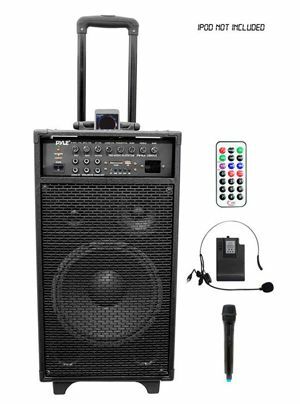 RECHARGEABLE BATTERY: This box type battery powered heavy duty wireless portable PA Speaker has a built in rechargeable battery which makes it convenient and portable. Perfect for personal, commercial indoor / outdoor use. 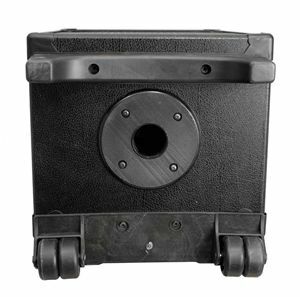 USE ANYWHERE IN THE WORLD: This unit can be used in America, Europe, and other compatible countries since it features a switch that lets you change between 110 volt -60hz and 220v-50hz. Ideal for patio party / public gathering.